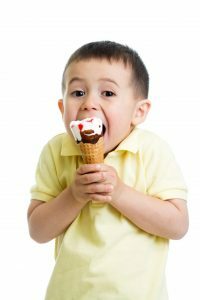 Having sensitive teeth is something that occurs very often, especially during the summertime, when people tend to indulge in sweets like ice cream, popsicles, and candy bars. When you consume too many sweets, your teeth sometimes become very sensitive, which makes it hard to chew, or even enjoy beverages. The good news for people suffering from sensitive teeth is that it doesn’t require a trip to the dentist, unless it is severe and persistent, because there are a few things you can do to treat the issue, which is listed below. Practice Good Oral Care: This is the best advice you will ever get from a dentist. If you brush your teeth at least twice a day, and floss daily, while making regular trips to your dentist’s office, you can prevent situations like this from occurring. Switch to Toothpaste Made for Sensitive Teeth: If your teeth are sensitive, an easy cure for it is to change the toothpaste that you are currently using, to one that is designed for sensitive teeth. After using it regularly for a period of time, the sensitivity in your teeth will gradually reduce. Use Dental Products That Have Fluoride: When it comes to sensitive teeth, fluoride is a big deal because it can help strengthen the surface of your teeth which has been affected by bacterial acids over the years. You should check to make sure that both your toothpaste and mouthwash have fluoride, to reduce any sensitivity that you are feeling. Use a Soft Bristle Toothbrush: Using a soft bristle toothbrush helps to keep your teeth’s protective layer as strong as possible because you aren’t scrubbing away the enamel protecting your teeth. Instead, it helps you clean your mouth without causing damage to your teeth and gums. Avoid Acidic Foods and Drinks: If you have sensitive teeth, you should stay away from acidic foods like fruits, and drinks like wine and soft drinks, because they add to the pain and sensitivity that you are feeling. Some sugary foods can also have the same effects, so you will also have to sacrifice those to reduce the sensitivity of your teeth. Avoid Smoking and Chewing Tobacco: Like acidic foods and drinks, smoking and chewing tobacco also contribute to the sensitivity of your teeth, so you should stay away from them also. These are a few things that you should do if you are experiencing sensitive teeth, and most of the time, they do work. If your pain is persistent, you should make an appointment to see your dentist, who will be able to help you reduce the sensitivity.